The provided image already gives us the first two parts of the flag (5YRS-4evr). According the image the 3rd part seems to be taken from the flag of the first challenge from HACKvent 2014, the 4th from HACKvent 2015 and the 5th from HACKvent 2016. Something happened to my wishlist, please help me. Repeatedly decoding the output of the last decoding seems to always yield another base64-encoded string. The challenges description mentions The fifth power of two, which points to the solution that the string must be decoded 2^5 = 32 times. I found those strange entries in my Android logcat, but I don’t know what it’s all about… I just want to read my messages! The challenge provides an android logcat-file. The file contains 3315 lines. The challenge description Lost in messages suggests, that we must find the relevant information within a lot of unnecessary stuff. Another point to notice (I only figured out later) is that the 03.12.2017 has been the 25th anniversay of the short message service (sms). Because the hidden flag has to be encoded in the log somehow and all other log entries don’t really seem to contain encoded information or any references, this entry seems right. Now it seems obvious that the message is an encoded sms (in PDU format). The challenge has been updated at 09:45. The PDF-file has been adjusted to make it easier to retrieve the flag. In the following description I used the updated version of the file (Hohoho_medium.pdf). There are many ways to hide information within a PDF-file which made this task quite challenging. There is a reference to a file named DroidSans-HACKvent.sfd. The name suggests that this is a custom font for the HACKvent challenge. So I decided to focus on the extracted fonts. At the beginning of the file usual ASCII-characters, which are used within the PDF-File, are defined (e.g. ‘d’ and ‘f’). The SplineSet after each character describes the appearance of the character. What seemed strange is that after the usual ASCII-characters a few unicode-characters are described ranging from 0080 up to 009c. The count of these characters (=29) coincidentally match the character count necessary for a valid flag (HV17-xxxx-xxxx-xxxx-xxxx). The challenge has been updated at 13:00. The hint formerly contained % (Modulo) instead of XOR. The flag-format (HV17-xxxx-xxxx-xxxx-xxxx-xxxx) consist of 6 x 4-byte blocks (including "HV17"). Because the description states Here is your flag followed by 6 x 4-byte hex values, it seems likely that each 4-byte hex value is connected to one block of the flag. Thus the first 4-byte hex value should be connected to "HV17". The big question was how to transform the hex values into the flag and how the hint can help us here. Googling for the resulting value 0xEDB88320 revealed that the value is a bit-mask used in the CRC32-algorithm. This hint was very valuable. 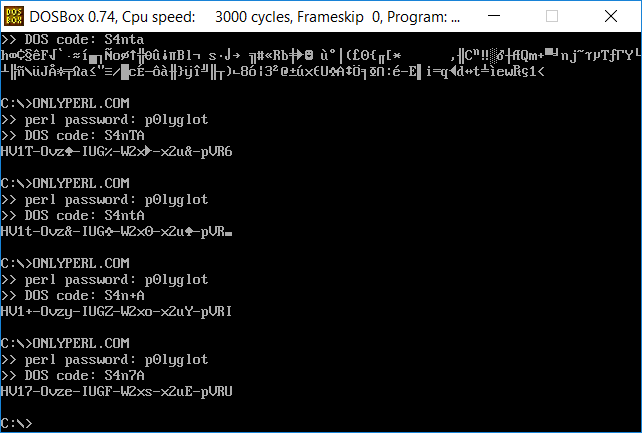 The 4-byte hex values seems to be CRC32-checksums of the corresponding part of the flag. The calculated checksum for "HV17" matches the first 4-byte hex value! While its quite easy to do this for the first part of the flag (which we already know is "HV17"), the following parts of the flag can be bruteforced. The provided link lead to a website which contains an image showing a QR-code. I scanned the QR-code online (https://zxing.org/w/decode) which yield the string Uzbekistan. After reloading the page, another QR-code was displayed containing the string Zambia. We were able to steal a file from santas computer. We are sure, he prepared a gift and there are traces for it in this file. Woohoo! We already got the flag. drwxr-xr-x  2 root root    512 Jan  1  1970 .
drwxrwxrwt 19 root root   4096 Dec 13 15:44 .. The challenge provides a file called True.1337, which is an ASCII-file containing two different parts. This seems to be python-code. The first part calls the exec function, which executes the given string. In this case the string passed to exec is concatenated by subsequent calls to the chr function, which returns a single character for the given ascii-value. The value passed to chr is composed of a lot of Trues, which are added together. Interpreted as a number True equals 1. Thus the value passed to chr matches the count of Trues given to chr. The second part also makes some nested calls, but we don’t know yet how the functions __1337 and _1337 are defined. At this stage we know how the functions of the second part are defined. __1337 is just a synonym for exec and _1337 takes one argument, divides it by 1337 and returns the corresponding character (A=chr;). Notice the embracing " around the number! The comparison in the final program is a string-comparison. If we just enter 1787569 the input function interprets our input as an integer and the comparison fails. So the array holds one dict with the keys op, content, mapFrom and mapTo. As we have already seen at first glance the value of op is map. mapFrom and mapTo contain different strings which seem to be a concatenation of unassociated characters. content holds a very large string. According to the challenge description we have to peel the not-so-real onion in order to get the flag. Because of the names of the entries in the dict it seems likely that op defines an operation we have to run on the value of content. The operation map and the two keys mapFrom and mapTo suggest that every character in the string defined by content has to be looked up in mapFrom and than be changed with to corresponding character in mapTo based on its index in mapFrom. Now the operation is called gzip and the only other key is our already known content. After defining a python function to execute the gzip operation yet another JSON-object can be revealed which contains an operation called b64. If the operation was not yet known the python-script stopped, I added the new operation and rerun the script. flag content content (may) contain the flag! Ouh? The onion has been peeled completely just to get "THIS-ISNO-THEF-LAGR-EALL-Y..."? Haven’t you ever been bored at school? Santa is in trouble. He’s elves are busy playing TicTacToe. Beat them and help Sata to save christmas! Challenge by pyth0n33. Have fun! I think you know the game from school...Don't you? Ok, seems like we just have to win again the AI. So you bruteforced last years math lessions? This time you cant escape! find “a” to get your flag. At 11:55 the numbers for the challenge have been changed, due to cheating activities. As stated in the challenge description we have to find a number a to satisfy the equation. Because of the quite big numbers bruteforcing doesn’t seem to be an option. After trying out different calculations I ended up googling for solutions to solve these kind of equations. This way I stumbled upon a modular equation solver ( https://www.dcode.fr/modular-equation-solver ). Well, quite a lazy but quick way. As M. said, kind of a different architecture! How about some custom asm to obsfucate the codez? The provided python-script defines different assembler-instructions (_add, _addv, _sub, _subv, …) and a quite long machine-code which is executed in a while-loop. muffinx: Did you ever codez asm? My first idea was to write a little disassembler to print the machine-code in assembly in order to understand what the code does. 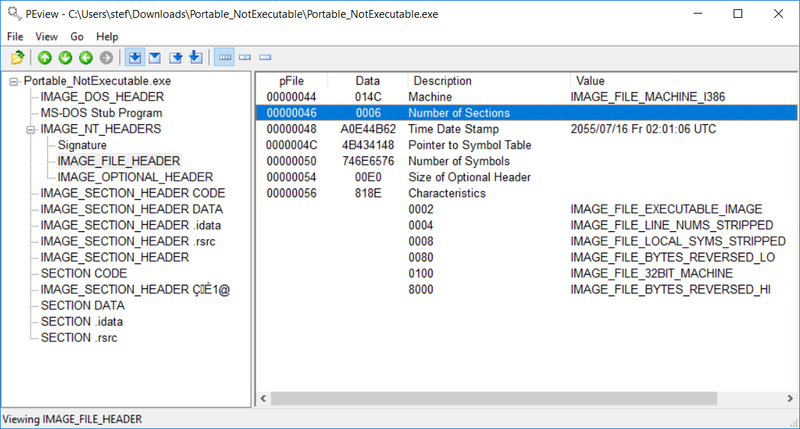 When viewing the assembler-instructions again and thinking about what the code does I thought that the most interesting assembler-instructions are _cmp / _cmpv, because these instructions must be used in order to compare the flag, the user entered, with the actual flag. Now script does not abort after the first character because r1 and r2 match for the first 5 characters. 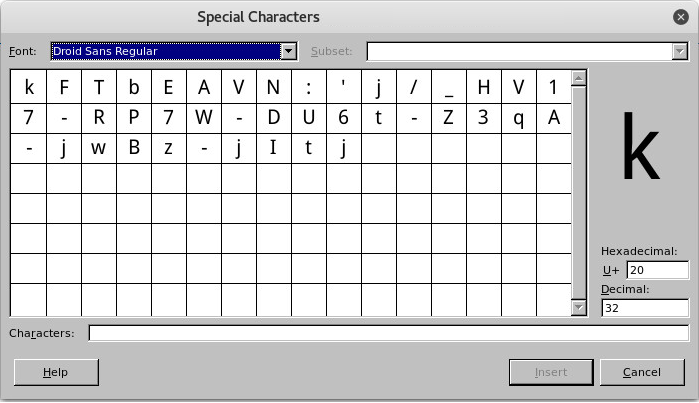 The script aborts at the 6th character because the t I entered (r1) should be an m (r2). The first added line prints a single character of the flag (value of r2). The adjustment in the second line lets the comparison always be true. Thus the script will not stop until every character of the flag is printed. todays gift was encrypted with the attached program. try to unbox your xmas present. So we are dealing with a Mach-O executable, used by systems based on the Mach kernel (macOS, iOS). After analyzing the binary (aaaa) we can list all functions with the afl command. The number of __gmpz functions stand out. Googling for these functions revealed that GMP stands for The GNU Multiple Precision Arithmetic Library. The library provides functions for arbitrary precision calculations. With the command pdf @ entry0 the entry-function is disassembled and we can see how the functions are used. The relevant parts in the output above are highlighted. At 0x100000d01 (line 41) the function __gmpz_init is called to create an integers stored at rbp - local_50h. At 0x100000d0a (line 43) the function __gmpz_init is called to create an integers stored at rbp - local_60h. At 0x100000d1f (line 47) the function __gmpz_init_set_str is called to create an integer stored at rbp - local_20h and initalize it with the string "F66EB887F2B8A620FD03C7D0633791CB...". At 0x100000d37 (line 52) the function __gmpz_init_set_str is called to create an integer stored at rbp - local_40h and initalize it with the string "65537". Then at 0x100000d4c (line 57) the address of the newly created integer stored at rbp - local_50h is also stored at rbp - local_80h (0x100000d58). The call to __gmpz_import at 0x100000dc4 (line 57) basically takes the input to the program and stores it as an integer at rbp - local_80h. Finally the function __gmpz_powm is called at 0x100000df4 (line 91) in order to calculate the crypted flag which is printed with the function __gmp_printf called at 0x100000e06 (line 95). g – base : this value is the input to the program and is unknown. This must be the plaintext-flag! x – exponent: this value is stored in integ40 which has been initialized with 65537.
y – result : this value is stored in integ60 and is printed by the program. This is the encrypted flag from the challenge description (0x7A9FDCA5BB061D0D638BE1442586F3488B536399BA05A14FCAE3F0A2E5F268F2F3142D1956769497AE677A12E4D44EC727E255B391005B9ADCF53B4A74FFC34C). N – modulo : this value is stored in integ20 which has been initialized with 0xF66EB887F2B8A620FD03C7D0633791CB4804739CE7FE001C81E6E02783737CA21DB2A0D8AF2D10B200006D10737A0872C667AD142F90407132EFABF8E5D6BD51. p and q are the factors of N. Thus N = p * q. So what is missing to solve the equation? We don’t know p and q (yet). Thus we have to factorize N.
This is a quite challenging task because N is very large. Luckily there exists pages like http://factordb.com to help us out. Now we have to calculate x^-1 mod phi(N). This is also called the modular multiplicative inverse and can be calculated with the extended euclidean algorithm. The List of all Users of the Unsafe Gallery was leaked (See account list). With this list the URL to each gallery can be constructed. E.g. you find Danny’s gallery here. Now find the flag in Thumper’s gallery. Understand how the URL is built from the account-data with the given example for the user Danny. Calculate the URL for Thumper. Access Tumper‘s gallery and get the flag. hash = hashlib.sha256()  # also try: md5, sha1, sha512, .. Trying the same for md5, sha1, sha512 didn’t reveal anything as well. So the first (long) part is equal. Then there is a gap and another equal part. Followed by another mismatch. The sha256 checksum of the email is calculated. For user Danny this is 6e772a62e85d4157b2f6898a03ab40162e2b7a9d7e143f91b43e07ffc7ed5a2c. This value is somehow adjusted. The value is encoded using base64. Hm, what’s when we take step (3) before doing the mysterious adjustment of step (2)? Now we are getting somewhere! In the gallery-id the characters +, / and = are omitted! When decoding the gallery-id as a base64-string the original sha256-checksum is messed up and thus we didn’t get an exact match. Santa programmed a secure jail to give his elves access from remote. Sadly the jail is not as secure as expected. `-.__. '|    \      |   |  |-. _.._|     |     /   |  |  `'. .-''``    |     |     |   /  |     `-.
.'`         /      /     /  |   |        '. '. `'. `-._     '.__  '-._____.'--'''''--. The flag is stored super secure in the function SANTA! We can input something to a variable a and the flag seems to be stored in a function called . It took some time that I realized that the actual problem here is that the input seems to be lower-cased before being evaluated. That’s why the super secure function SANTA is defined in upper case. When entering SANTA the input is converted to lower-case santa, which is not defined. The string-array denied seems to be the blacklist. The builtin function input evaluates the input as python-code before returning. Thus we could evaluate unfiltered input. Unfortunately the u in input is not an accepted character and thus our input would be blacklisted. Nice! We called the function __builtins__.input() by borrowing the u from the denied-element upper. 1337? This cannot be a coincidence!? Great! It seems that fhe flag was XOR-ed with "13371337...". This encrypted flag is yet again XOR-ed with the input to the SANTA-function and then returned. 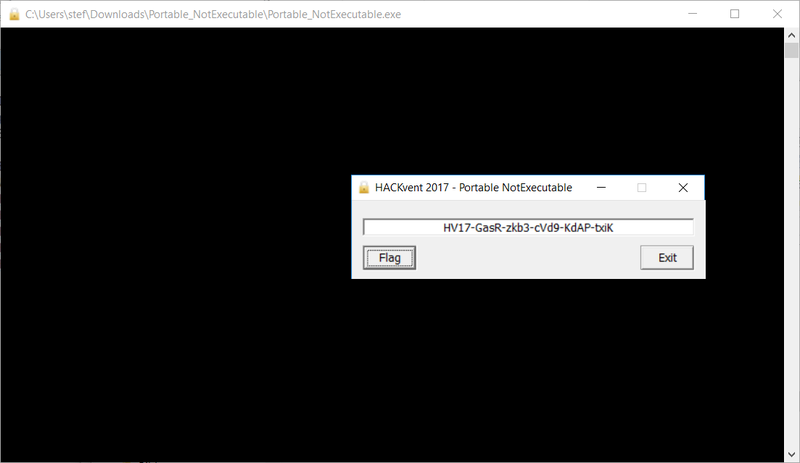 but wait – its not running, because it uses the new Portable NotExecutable Format. this runs only on Santas PC. can you fix that? HV17-GasR-zkb3-cVd9-KdAP-txi is almost good. but why the black window? 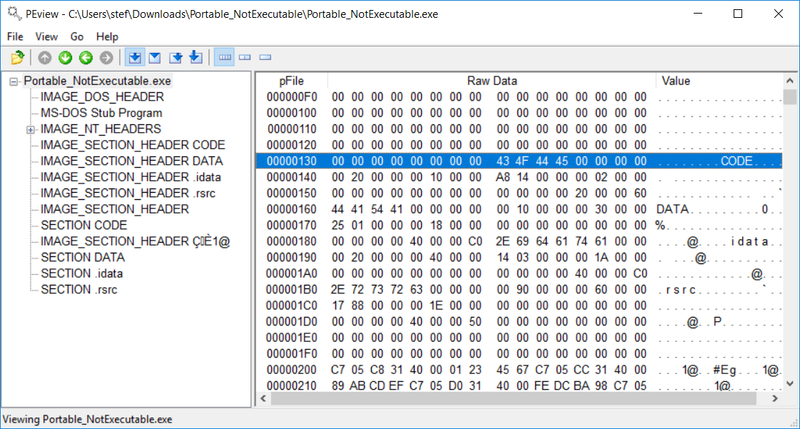 After comparing the file with some other ordinary PE-files in a hexeditor I changed my mind and decided to further analyze the file on windows. Just executing the file raises an error. Considering the hints we have to patch the file to make it run. 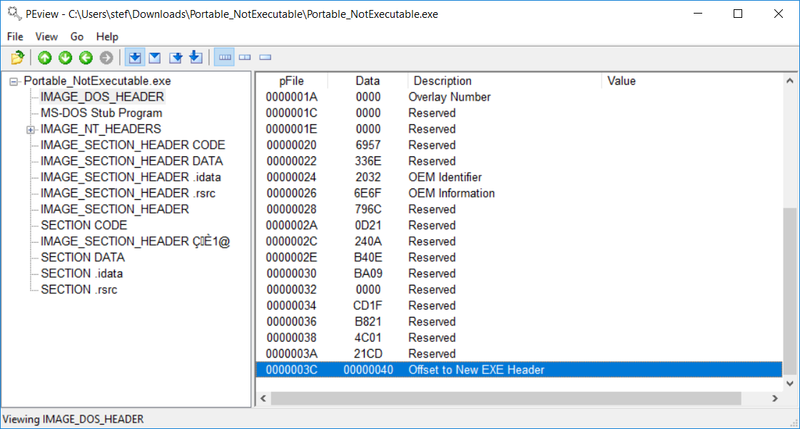 In order to understand what needs to be patched I used PEview, which is a good tool to view PE-files on windows: http://wjradburn.com/software/. On the left side we can see all headers and sections within the PE-file. If we select a header we can view the single fields and values on the right side. The first thing to notice is that there is no valid DOS signature and the PE magic signature was changed to PNE. 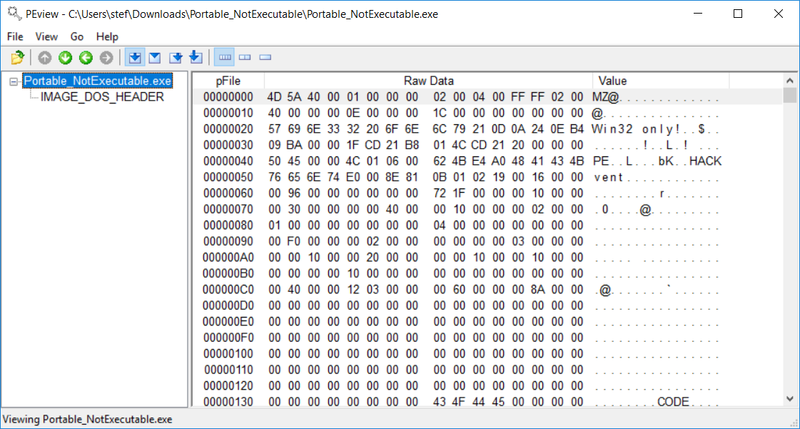 The byte at offset 0x01 should be edited from 0x53 to 0x5A (also see screenshot from calc.exe). The bytes at offset 0x41 and 0x42 should be edited from 0x4E to 0x45 and from 0x45 to 0x00 (also see screenshot from calc.exe). Nothing suspicious so far until the last field Offset to New EXE Header. This field indicates where the actual EXE header begins. But the value is 0x20 !? As we can see at the offset in the column pFile the DOS header is even longer. Comparing it to other PE-files I decided to patch this value from 0x20 to 0x40. Looks even better now. 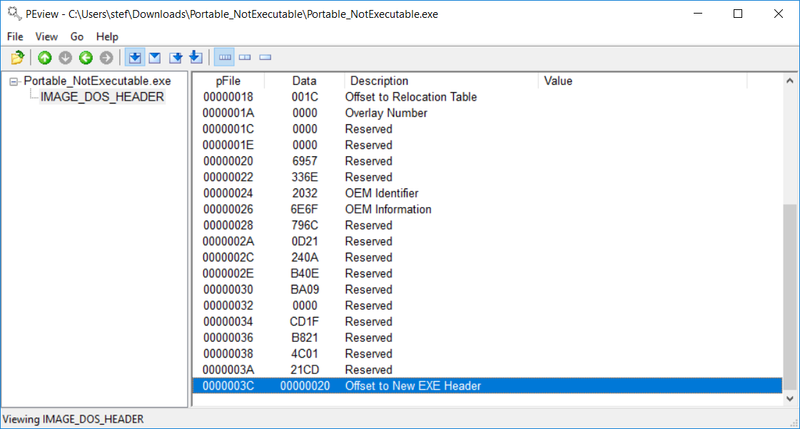 PEView can parse the NT header and displays all sections. But there is still something suspicious: the 5th section after .src does not have a name. And after this no-named section header follows a SECTION CODE? And after this a section called CE1@ something? There must be something else messed up. Number of sections 6? That seems not correct. Let’s patch this to 4. That’s better! Now the sections are parsed correctly. After clicking on Flag a flag appears! Hm, but wait. It’s not the correct flag. And why is there a terminal in the background? Last year we played some funny games together – do you remember? ready for another round? download the game here and play until you find the flag. dr-xr-xr-x 1 root root  2048 Nov 15 21:09 .
drwxr-xr-x 1 root root    80 Dec 30 15:21 ..
dr-xr-xr-x 1 root root    2048 Nov 15 21:09 .
dr-xr-xr-x 1 root root    2048 Nov 15 21:09 ..
A lot of code. I have highlighted the calls to DrawString. Before the call of the 4th DrawString there are a lot of suspicious load/store/xor instructions. That’s where we should go deeper. What followed was a lot of lookup-and-understand work. I looked up most of the instructions here: http://www.ds.ewi.tudelft.nl/vakken/in1006/instruction-set/. I figured out that there are basically 3 memory-regions involved with 29-bytes. As the flag-syntax is HV17-xxxx-xxxx-xxxx-xxxx-xxxx this exactly matches the 29 bytes. In the biggest block of code between 0x000107d0 and 0x000108fc (lines 73-148) lwz / lbz (Load Word/Byte and Zero) and stw / stb (Store Word/Byte and Zero) is used to initialize these memory-regions. The actual calculation is done between 0x00010900 and 0x0001094c (lines 149-168). Pay the price, Thumper did it already! This flag has been taken for ransom. Transfer 10’000 Szabo to 0x1337C8b69bcb49d677D758cF541116af1F2759Ca with your HACKvent username (case sensitive) in the transaction data to get your personal decryption key. To get points for this challenge, enter the key in the form below. Disclaimer: No need to spend r34l m0n3y! Enter your 32-byte decryption key here. Type it as 64 hexadecimal characters without 0x at the beginning. 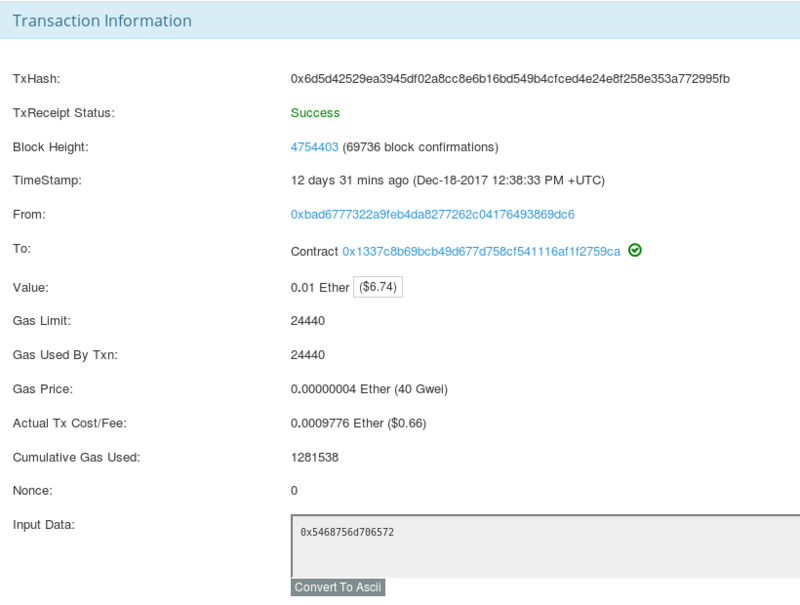 Somebody payed 0.01 Ether to the address. According to the challenge description Thumper already payed the price. So it’s no surprise that the hex-values in the field Input Data are the ASCII-characters T-h-u-m-p-e-r. There are 4 x 32-Byte values. For the last one I selected Text which displays the words: Your key is here. According to the challenge description the key we have to enter is a 32-byte key (= 64 hexadecimal characters). 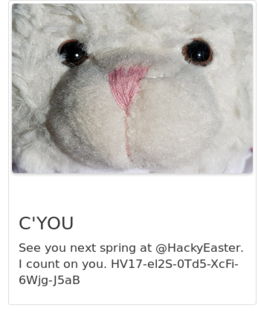 Thus the first value must be the decryption key for Thumper (9880cccfe81a075ff0d029b4351ef4496ae452199b831634af57e5951466349d). In the lower window we can see the contract code. This code is executed on the input data and generates the 4 x 32-byte values of the output. So we just have to input our nickname according to the challenge description, run the code with this input and get our decryption key. Sounds easy. Theoretically. I used quite a lot of time to google things up. 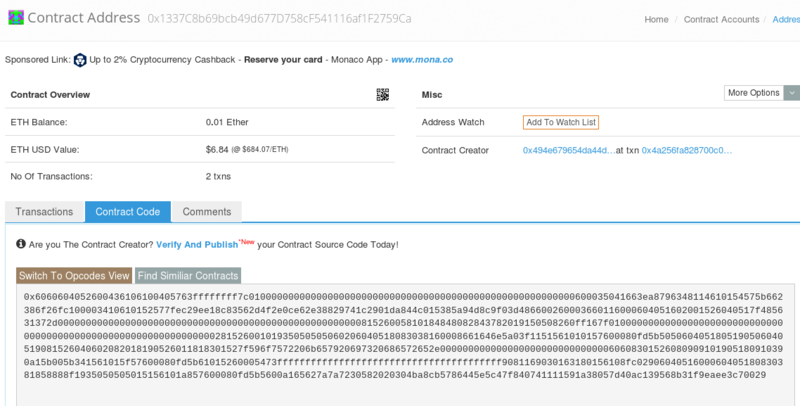 I learned that the contract codes are interpreted by a virtual machine called Ethereum Virtual Machine (EVM). Thus I searched for different implementation which can execute evm bytecode. As the input I converted my nickname "scryh" to ASCII: 7363727968. Hm, doesn’t look like a decryption key. Something must go wrong here. The meaning of the instructions can be looked up here: https://ethereum.github.io/yellowpaper/paper.pdf (page 23 ff). The first instruction pushes the value 0x2386f26fc10000 on the stack. The instruction CALLVALUE is defined as the following: Get deposited value by the instruction/transaction responsible for this execution. Thus it puts the deposited value on the stack which is then compared to the formerly pushed value by the third instruction: LT. If the callvalue is less than 0x2386f26fc10000 the following JUMPI to 0x0512 is taken. The relevant parts are highlighted. The CALLVALUE instruction pushes 0 on the stack (line 13). Thus the less-than-comparison results in true = 1 (line 19). Because of that the JUMPI is taken and the pc proceeds at 338 = 0x152 (line 28). Let’s patch the bytecode in order to prevent the jump from being taken. A quite easy way is just to adjust the value pushed on the stack. I changed it from 0x2386f26fc10000 to 0x00000000000000. By doing so, the less-than-comparison result in false = 0 and the jump is not taken. My decryption key is 23109b1a4c08bd64c34110395406e5f4dc8e1bfd873ef3982a23b783550325b2. :  |  ( - )  |  :      - ohai! pls food! The first call to fgets (line 65) will succeed without any errors. The maximum size to read passed to fgets is 0x400 (esi at 0x00400714 on line 63) and the buffer used is also 0x400 bytes long ([rbp - local_4d0h]). No overflow here. The second call to fgets (line 79) right after the prompt for food (puts on line 74) also passes a maximum size of 0x400 bytes (esi at 0x00400756 on line 77). But this time the used buffer ([rbp - local_d0h]) is not 0x400 bytes long! As we can see at the top where the local variables are declared the next variable after [rbp - local_d0h] is [rbp - local_8h] (lines 45-46). This means that the buffer used is only 0xd0 - 0x8 = 0xc8 = 200 bytes long! If we feed more food to the tamagotchi we can cause a bufferoverflow and overwrite the return-address on the stack. Along with other information we can see that NX is enabled. 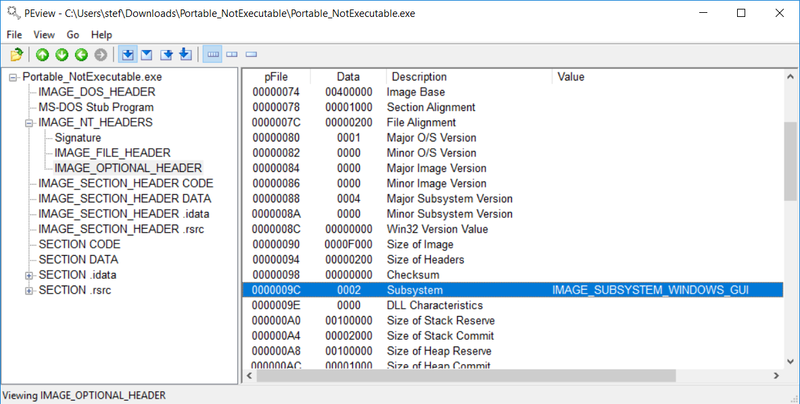 This means that memory regions like the stack are marked as non-executable. In a simple bufferoverflow exploit we would put some shellcode within our injected buffer and than make the return address point to that shellcode. 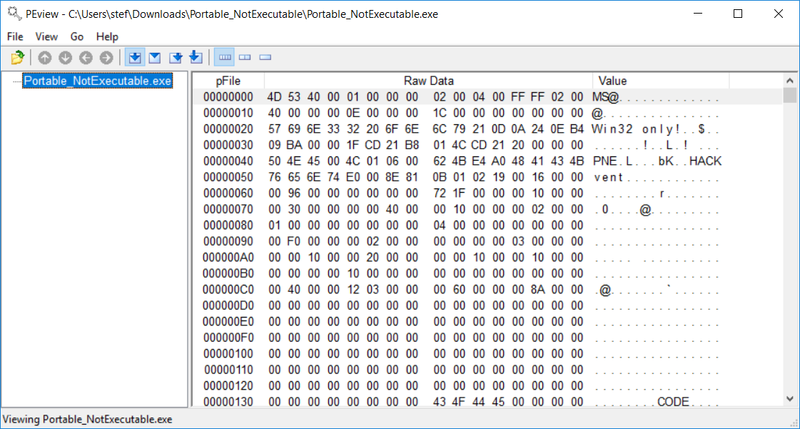 With NX enabled the CPU wouldn’t execute our shellcode because it resides in a memory region marked as non-executable. Thus this kind of exploit fails. In order to exploit the bufferoverflow anyway we can use a technique called return to libc. This technique takes advantage of the fact, that nearly all programs make use of libraries like the standard c library libc. Libraries used by the program are mapped to the memory space of the program. 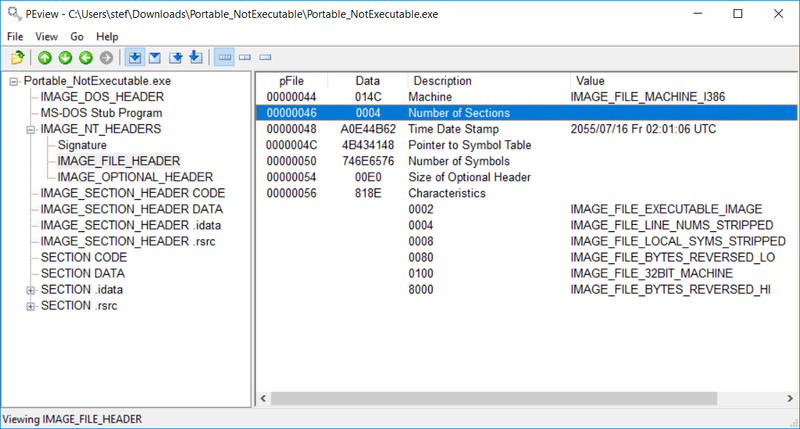 These memory regions must be executed and thus cannot be marked as non-executable. If we find a function or part of a function in a library we could use, we can just set the return address to this address instead of a self injected shellcode. As we usually want to get a shell the libc-function system(const char *cmd) with the argument "/bin/sh" will do. Ok, let’s get to work and start by identifying the offset to the return address we want to overwrite. We can do this by creating a pattern with metasploit and feed this pattern to the tamagotchi. When the next return instruction is reached, the return address has been overwritten with our pattern and we can see at which position of the pattern the return address is. This way we can calculate the offset. Another thing to notice here (see radare2 disassembly above): the return instruction at 0x0040079d is only reached, when we leave the program. Thus we have to feed the tamagotchi and then chose 2 (bye) in the menu in order to reach the return instruction. and &amp;amp;amp;quot;show warranty&amp;amp;amp;quot; for details. This GDB was configured as &amp;amp;amp;quot;x86_64-linux-gnu&amp;amp;amp;quot;. Type &amp;amp;amp;quot;show configuration&amp;amp;amp;quot; for configuration details. Reading symbols from tamagotchi...(no debugging symbols found)...done. I started gdb with the binary, set my favorite disassembly-layout (intel), disassembled the main-function and then set a breakpoint to the return-instruction at main+211. There it is. Now we know where to put the return address. But what return address should we put there? Because we have the libc-library which is used on the server (see File #2: libc-2.26.so) we can calculate the offset the functions within the library. After this we can use pwntools which is very handy for tasks like this. Now we have got the offset to the target function and the string we want to pass. What else is missing? The actual address in the memory address of the program. Because a library is not always mapped to the same memory region we need to know the base address of the libc mapped to the program’s memory space. If we have the absolute address of only one function within the libc we could look up its offset and subtract this from the absolute address resulting in the base address of the libc. We will use the function puts which is already used by the program. Because of that the absolute address of the function will be in the Global Offset Table (GOT). If we call puts with the address of the puts GOT-entry the absolute address of the function will be printed. More on PLT/GOT is explained here: https://www.technovelty.org/linux/plt-and-got-the-key-to-code-sharing-and-dynamic-libraries.html. The puts GOT address is 0x601018 and the PLT address 0x4004b0. There is yet another point to notice: with x86 on 32bit the function argument to libc functions were passed directly on the stack. Thus we would just have to push the address of the string "/bin/sh" on the stack. 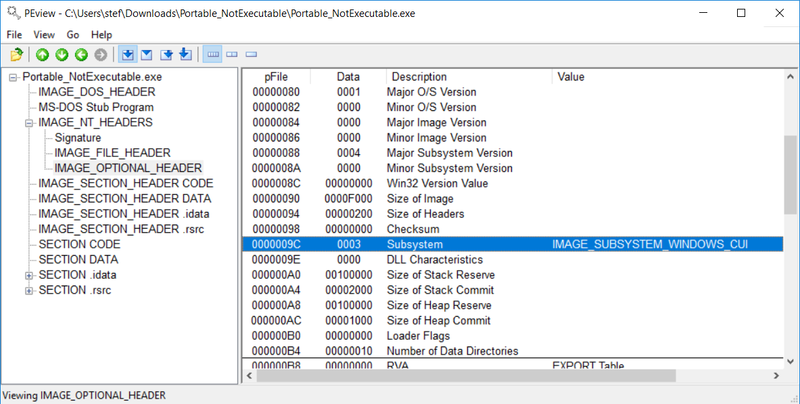 With x86_64 on 64bit the function argument is passed in the register rdi. This means that we have to put the address of the string "/bin/sh" in the register rdi. How could this be done? At this point we need return oriented programing (rop): we search for useful assembler-instructions in a library, which is loaded in the memory space of the target program (e.g libc) and end with a return instruction. These useful assembler-instructions ending with a return instruction are called rop gadgets. We can make use of them by pushing two addresses on the stack: (1) the address of the rop-gadget and (2) the address of where we want to proceed after the execution of the rop-gadget. The CPU will first pop the address of rop-gadget and then execute the instructions of the rop-gadget until reaching the return instruction. At this point the second address we pushed on the stack will be popped and the execution proceeds at the address of our desire. By finding a rop-gadget which will pop rdi and then return we can easily put the address of the string "/bin/sh" from the stack to the rdi register. Great! At 0x400803 in the tamagotchi binary there is a rop-gadget of our needs. It’s basically the same like in stage1. Only the payload differs. At first we put (yet again) our rop-chain on the stack. Then the argument which should be popped to edi. And then our final function-address: the formerly calculated absolute address of system. After sending the payload we chose 2 (bye bye) again in order to let the return instruction make our call to the system function. 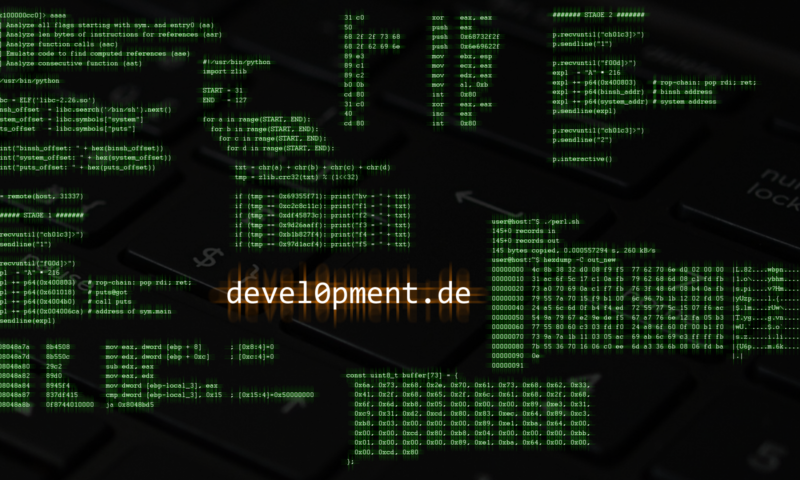 The method interactive() redirects stdin to our keyboard input and we can interact with the program ourself. … but there is always one more way to approach things! Decryption done, are you happy now? 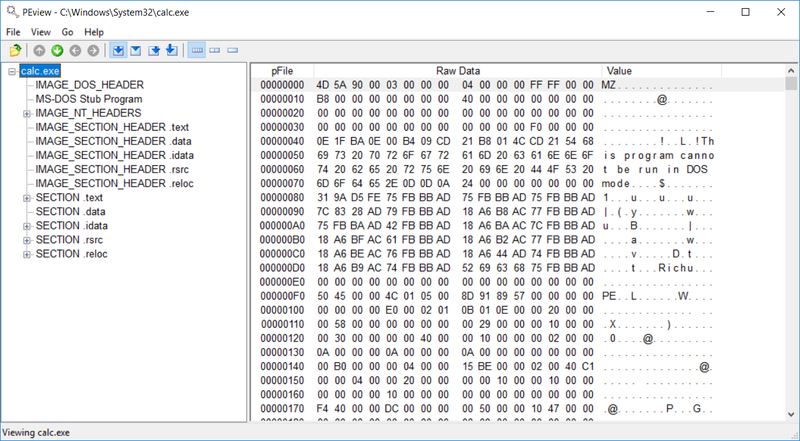 Comparing the two hex-dumps we can notice that the 4th, 12th, 20th, 28th, … bytes are different. It’s also eye-catching that the 1st to 4th and the 9th to 12th byte of every row is within the ASCII-character-range. It seems likely that the output is encoded with our password as a key of length 8. That’s why every 8th character (4th, 12th, 20th, …) is different as we only changed one character in our password. Also our password only has a length of 4 so the key must be padded resulting in the eye-gatching gaps of 4 bytes. I tried different passwords and recognized that the first part of the output might be a flag. Are you sure that only perl can parse Perl? Microsoft's ye old shell does not even know /usr/bin/perl. The challenge description also suggests that we should execute the file with something other than perl. Now we have got a specific hint. I don’t really know what’s meant with Microsoft’s ye(?) old shell, but this sounds like DOS. 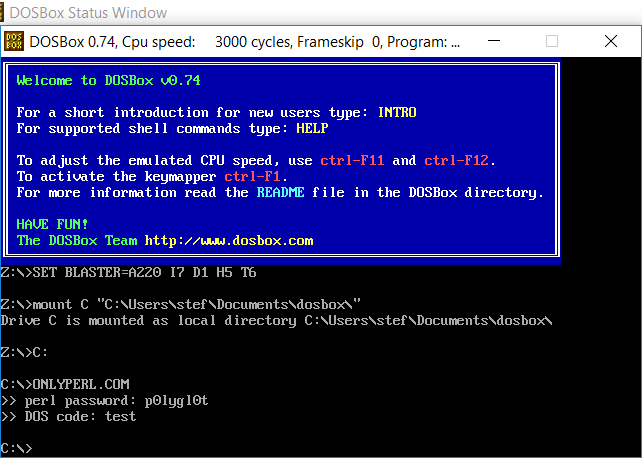 Thus I startet googling for a DOS-emulator and stumbled upon DOSBox: https://www.dosbox.com/. Looks good! The binary is running. At first there’s a prompt for the perl password. We already know that this is p0lygl0t. But what’s the DOS code? Entering test just terminates the program.